We’ve been talking about sublimation a lot on this blog recently. There a couple of reasons for that. First, sublimation is popular and a lot of people have questions about it that we can answer. Second, we just introduced an awesome sublimation package and naturally we wanted everyone to know this package was available. So, for most days in the past few weeks, this blog has been a little sublimation heavy. Today is not, however, one of those days. Today I want to talk about ChromaBlast Ink and what it can do for those who want to decorate cotton garments. Many people will tell you that the best way to decorate cotton is to do direct to garment (DTG) printing, and that may be the best way for some people. Other people may find that DTG printing has a rather steep learning curve, that DTG machines can on occasion be temperamental, and that optimum quality and smooth running requires constant use and a high production level. DTG is not for everyone, and those people who choose not to do direct to garment printing may find that ChromaBlast suits their needs quite well. ChromaBlast inks are to cotton what Sublijet inks are for sublimation. If you want to decorate cotton substrates, ChromaBlast should be your ink of choice. It can be used on any light colored cotton garment or item made of cotton. These inks offer consistent accurate color with photo-quality output. EnMart offers ChromaBlast in C, M, Y, and K cartridges and bulk systems. You will not find ChromaBlast ink for dark garments. If you are interested in decorating dark garments, your options are DTG printing, as mentioned above, Ntrans transfers or Direct Screenprinting. 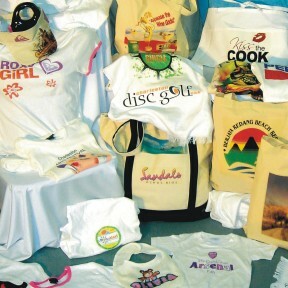 If, however, your interest is in decorating light colored garments, you will find that ChromaBlast creates vivid, colorful prints with a soft hand. When used in conjunction with the ChromaBlast paper, the ink creates transfers that can be heat pressed to a cotton garment. The process is simple and there is a relatively small learning curve. ChromaBlast ink is not yet available for every printer that EnMart offers. To be sure that you purchase a printer for which Sawgrass has developed ink, make sure you buy your printer from our ChromaBlast printer category. I have just purchased a sawgrass printer. Put ChromaBlast ink and paper in it. Printed a name and put it on a white cotton shirt and it has a white outline on it that you can see. Any suggestions on how to avoid this? Hi Gloria, the Chromablast paper transfer layer is transparent, and while you can see an outline around a design on a white t-shirt, it is faint and definitely not white. If you were to transfer the entire sheet and had a large area outside the design without trimming it, you would see a clear layer and it would be visible – but it won’t be white. Are you sure you are using Chromablast paper, and not something else? It sounds like the paper you are using is one designed for dark t-shirts, perhaps something like our ChromaDark, which does have a white film layer you print on to block the t-shirt color from showing through, and if it isn’t trimmed, it will show white outside the design area. If you are using white t-shirts, make certain you are using actual ChromaBlast paper for the white shirts. It is definately ChromaBlast paper. I am going to work with it and see if I can figure something out. Thank you for your response. Hi Gloria, let us know what you find out. The basic tips are: trim as close to your design as you can before transferring, use 100% cotton shirts, and high pressure. Also, a lot of that faint outline from the transfer film around the edge will go away once it’s washed. Good luck! ← What Exactly Can You Sublimate?